Scandal is back, and the season 3 premiere was full of all the preposterous foolywang we've come to expect from our favorite prime-time soap opera. Fitz and Liv—who should, by now, be good at having an affair—continue to make out in the Oval Office without locking the door. Vice President Sally Langston has turned on Fitz and is now running against him in his re-election campaign, which means that there are now two killers vying for the White House. And former gladiator Quinn is stealing babies. 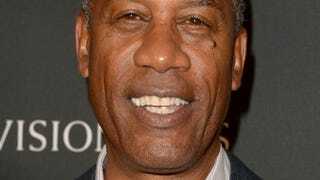 Despite all of these highlights, Olivia Pope's father (Joe Morton), whom Twitter affectionately calls Daddy Pope, managed to steal the show with his scary Shakespearean speech to his daughter. After Fitz snatched his post as command of the supersecret operative B613, Daddy Pope issued a grim warning to Liv about the revenge he seeks. He said, in short: Your boo ain't about this life, and neither are you, so run. "Start grieving now. Rend your garments. Curse the heavens. But first, run," he warned. Eeek.